Anyways, I used this manga scan. I really loved it, Hibari looks so damn awesome in there <3 Then again, he always makes me squeal. The vector was easy, I got used to vectoring manga scans, even with a slight reconstruction here and there. The background on the other hand... >.<'' Well, I used mostly Evangelion scans & a few dA brushes (which I had installed long time ago, dunno from where). You can get the Kyoya .png from EDD. 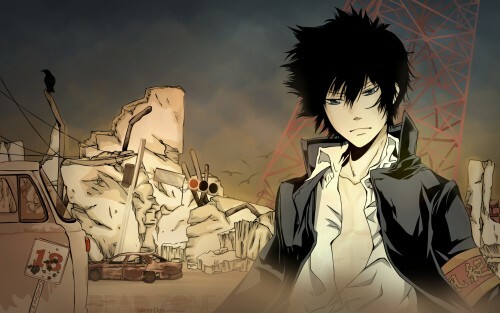 awesome i love it oh my hibari sama with shirt open with destroy city in the backgorund! Oh yeah this is awesome! My mouth wont shut :o AWESOME! Great work^^ and good idea with the background XD it fits him perfectly! Great wall! I love how Hibari looks here...his eyes are gorgeous ! Love the whole feeling of the wall! Awesomeness. He is the smex, yo. I love the background (fits the scan perfectly) and everything is neatly vectored! Yay! Very cool! I lurve the bg, it's perfect with the character, of course it's vectored flawlessly, and it's just awesome. HIBARIIII! He looks so AWESOME here! and the bg is really GREAT! Definitly set it on desktop now! Whoa! This is an awesome wall of Hibari! Yay! Thanks so much for sharing! so i was looking at this up close while uploading it to new EDD and i have to say i appreciate the detail so much more than the first time i looked at it. but i think that the collapsing tower looks flat compared to the rest of the wal, it would have been better in a darker color so it just looks like solid black which fits with the other black you've got going on.